Review/Giveaway – Flowerz In Her Hair! I have had the pleasure of working with Amy at Flowerz in Her Hair before. The bows and flowers available are just adorable! Go check them out! 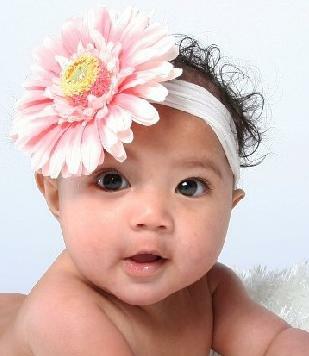 Flowerz in Her Hair has also established The Heart Babies Collection. Proceeds from this collection will help the family of Alyssa Roze who was born with a congenital heart defect (CHD) known as Tetralogy of Fallot. I encourage you to view the collection and read Alyssa’s story as well as Amy’s own son Chandler’s story for which the collection was created. I love that the bow and flowerz go with pretty much everything she owns – she can be beautifully accessorized at all times! Flowerz in Her Hair is a great place to buy flowers, bows,clippies, beanies, headbands, even veils and halos. If you have a special occasion coming up or you just want some cute coordinating hair things, Flowerz in Her Hair will have what you need. They even do special orders – call her at (877) MY9BOWS to discuss what you need! Currently Flowerz in Her Hair is offering a free Clip Holder with every order! One lucky reader will win a $20 eGift Card to use for anything on Flowerz in Her Hair! Visit Flowerz In Her Hair and comment back with your favorite item! The following can be done DAILY:Tweet about this giveaway! RT @mommywantsfree @amyflowerz WIN! $20 GC from Flowerz in Her Hair! Ends 6/8 bows & clippies #giveaway http://tinyurl.com/mwflowerz (1 entry per tweet per day) Giveaway ends Wednesday June 8th at 11:59pm. Winner has 48 hours to respond to my winning email! Please make sure to include your email in each comment unless it is in your profile. Color of the prizes distrubuted to be determined by the sponsor. Giveaway open to US and Canada! Not sure if you meant to visit Admiral Road but I like the Aardvark Monkey Scarf there. 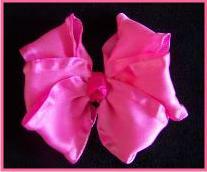 I really like the Lanie Bows! I like Flowerz in Her Hair on FB! Following Flowerz in Her Hair on Twitter (@sazzyfrazzy)! Entered the $10 Amazon GC Giveaway! Entered the Thirty-One Gifts giveaway! love the pink snap clippie! Just visited Flowerz for Her Hair. My THREE favorite things are the Funky Flowers, Beanies, and the Bracelets. I’m IN LOVE with the "cute as a button" line – we love ponytails here and the button/ponytail holders are SO cute. Off to buy some right now!